Booking for the Venom Intensive Skills Sessions is open now! 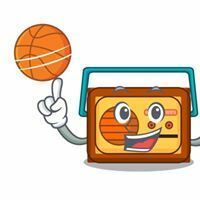 LEVEL 1 SCORING COURSE - Would you like to watch basketball for free? Become a Scorer and get the best seat in the house! Get in quick as these sessions will fill up FAST!! Check out the information on upcoming Venom Specialised Skills Sessions for U12 & U14 Venom Players - run by Warrandyte Youth League Women. A great opportunity to learn from Australia's Men's and Women's Coaches!! Nominations for the Annual Club Awards for the WBA are now open. The Warrandyte Venom would like to advertise an ADDITIONAL UNDER 21 GIRLS TRYOUT - THIS IS ALSO OPEN TO ANY NEW PLAYERS TO ATTEND. 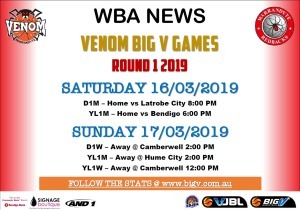 The Warrandyte Venom Big V Open Sessions and Tryouts are now confirmed. You can register by clicking on the appropriate link on the right hand side of this page. 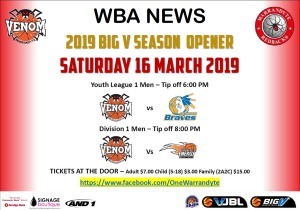 The Warrandyte Basketball Association is proud to announce the signing of CILLA BERTOLDI as Head Coach of the Youth League Women for the upcoming Big V season. The Warrandyte Basketball Association is proud to announce the signing of Canadian player, Jacob Thom, for the up and coming 2018/2019 Big V season. The WBA is pleased to present the 2019 Senior Men's and Senior Women's Coaches. Want to work on your skills during the Holidays? Congratulations to WBA Coaching Advisor RYAN HOLLOWAY who has been announced by Basketball Victoria as the Head Coach of the Victorian Ivor Burge Men for 2019. Missed the REDBACKS registration deadline?? Not to worry - you can now join the Waiting List for the upcoming season and the WBA will contact you to advise if there is a spot available in a team. 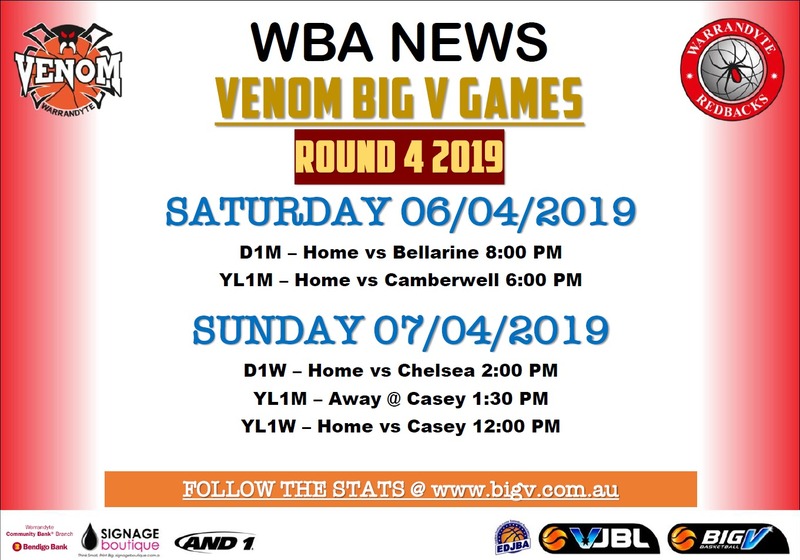 Warrandyte Venom Rep Ready Clinics - available for players who haven't played Rep Basketball but wish to try out for Venom in 2019. Register via the Venom logo on right hand side of this page. Warrandyte Basketball Association's rep program "Warrandyte Venom" are seeking applications for coaches to be part of the VJBL program for the 2018/19 season. This includes positions for some of our top ranked sides. WBA are pleased to announce the appointment of RYAN HOLLOWAY to the position of Coaching Advisor for Warrandyte Basketball Association. CONSIDERING BECOMING A REFEREE? - Looking to earn money while keeping fit and improve your rule knowledge? Good morning all, please see the below information regarding an upcoming shooting and skills clinic run by David Nurse (NBA shooting coach). 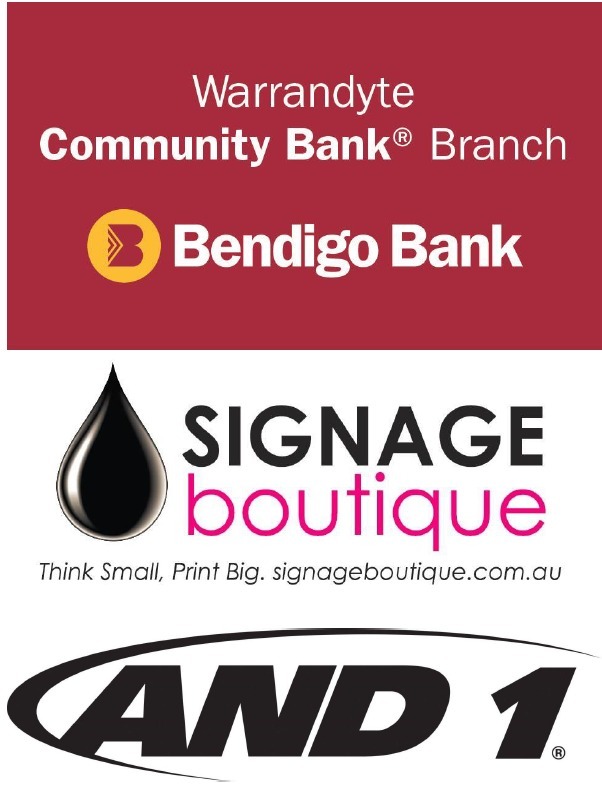 David has previously run a clinic at Warrandyte and we had some very positive feedback, and would highly recommend attending if you are able. Fresh stock for the upcoming season - available now!! Congratulations to those who have been appointed as Head of Age Group - Girls program. Warrandyte Basketball Association's rep program "Warrandyte Venom" are seeking applications for coaches to be part of the VJBL program for the 2017/18 season. This includes positions for some of our top ranked sides. The WBA are currently reviewing our social media platforms, including the creation of a SINGLE Facebook page for club news and information. This will include Redbacks AND Venom information. Registration for Redbacks for the upcoming Winter season is now CLOSED. Applications for this position close 4TH OCTOBER 2016. Warrandyte Venom Junior Rep Head Coaches announced for Season 2016/2017. Online registration for Redbacks Summer 16-17 season has NOW CLOSED. Congratulations to Ange and the Youth League Women on finishing on top of the ladder, and securing a home semi final! Each year the WBA presents a number of awards that recognise members who have made significant contributions during the previous 12 months. 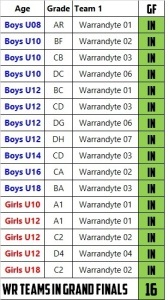 Warrandyte Basketball are looking for current & past players / teams to register their interest in a Sunday night competition to begin in August 2016. This is open to ALL players (male & female). The Warrandyte Venom recently raised funds at their "Pink Night" Fundraiser, with these going towards The Walter and Eliza Hall Institute (WEHI). Congratulations to the SEVEN (7) REDBACKS teams that have qualified for the EDJBA Summer 15/16 GRAND FINALS - which will be played on Saturday 19/03/2016. Congratulations to ISABEL GOUGH (Under 14.2 Girls) who has won the vote for the Week 10 Girls Got Game award. 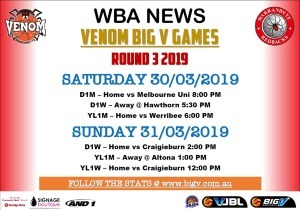 Warrandyte Venom are searching for a coach for the Under 20.3 Boys for the upcoming MUVJBL season. NEED A REFRESHER IN SCORING? Or need to learn how to score for rep basketball? Click on MORE to get details for Venom Tryout practice games vs McKinnon on Friday 23 October 2015. Please be advised that we have reached our allotment of available registrations for the Term 4 Aussie Hoops program. Thank you to all those that have processed their registration. Registration for the Redbacks Summer 2015 / 2016 season HAS NOW CLOSED. WARRANDYTE VENOM SENIOR MEN WELCOME BACK "STRETCH"
This weekend sees the Warrandyte Venom Youth 2 Men and Youth 1 Women feature in BigV Grand Finals. 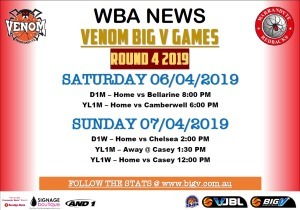 WBA would like to congratulate three Venom players HANNAH BENSCH, BRENTON CHARLES and CHELSEA BEAL who celebrate milestone games this week. Congratulations to Venom Youth League Women’s player ELLEN PATTISON (sponsored by Smash FM) on reaching 100 Big V games. Congratulations to Venom Youth Men's coach BEAU BENTLEY on being awarded the April Big V Coach of the Month. Congratulations to Venom Youth League Men’s player NATHAN DE LACY (sponsored by In2Coolrooms) on reaching 50 Big V games. Nathan began playing Big V in 2012, and in season 2015 averages 9.5pts, 5.3reb per game. CONGRATULATIONS!! Congratulations to the winners of the Grand Hotel Player of the Week from last Saturday - Nathan De Lacy (Men) and Amanda Hederics (Women). Thank you to all who have registered for the Beginner Referee Course. We have reached the maximum number of participants for the current course. Please keep an eye out for the next beginner course to be run later in the year. Interested in touring the USA with Warrandyte Venom? GIRLS GOT GAME NOMINEE - CONGRATULATIONS ABBY! On Sunday 24th August 2014, Gerard Stevenson suffered an unimaginable fall and has been left a quadriplegic with a tracheostomy. He will remain this way FOR LIFE!! Warrandyte Basketball Association's rep program "Warrandyte Venom" would like to hear from experienced coaches who would like to bring their expertise and passion for basketball to Warrandyte as a head of age group coach. In order to effect change, the VJBL has initiated the Girls Got Game program fully supported by Basketball Victoria. Check out the below link for information regarding the Mac Pack Superclinic being run throughout the state. HOW IMPORTANT IS A MOUTH GUARD? YOU MIGHT BE SURPRISED. Nicole Howard is the newly appointed “Gardiner McInnes” Warrandyte Venom Big V Championship Women’s Coach for 2014. Each year many new players from domestic clubs attend Venom tryouts, but there are many more who aren't quite sure of how Venom fits into the local basketball pathway. 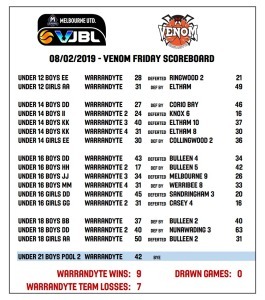 Here is some information for parents and players who have heard about Warrandyte Venom and want to know what Friday night rep-ball is all about.